A project is a unique scheme of actions and activities that is required for achieving a specific objective within a specified time schedule and budget. This implies that the project boundaries must be clearly defined with a scope definition, list of what is to be provided under contract (such as: documents, services and materials), start date, and completion date. A project phase or project sub activity can be considered as an independent activity, in this case the activity should be considered as a project in its own right and the same criteria must be applied as if it is a separate project. ● Project manager, who has the overall responsibility. He is the official single line of communication with the client. ● Project engineer for monitoring and coordinating the day to day project activities. ● Discipline engineers providing the engineering expertise as required for the project's execution. ● Planning and estimating engineers. ● Project administration; such as; document control and project secretaries. ● Project Quality Assurance/Quality Control. The project manager reports to the project management board or directly to the executive management. For maintaining executive management control and ensuring a neutral line of communication with the clients’ senior management it is recommended to appoint a project sponsor; i.e. a senior management representative. The engineering manager is responsible for the integrity of the design and will provide recommendations for improvement or alteration on engineering and design issues as deemed necessary. Completion of a project can be considered successful when it meets the client’s technical requirements and expectations, on schedule, in full compliance with the contractual obligations, and within budget. ● Assessment of contractual constraints, minimize risks and liability exposure, as well as developing a risk profile. ● Monitoring progress and expenditures for ensuring that the project is delivered on time/on schedule and within budget. ● Scope control, i.e., ensuring the project is being executed in conformance with the technical requirements and conditions. ● Monitoring cash flow, working capital, cost and expenditures. ● Monitoring sub-contractor and vendor performance and any third party involvement . A project life cycle can be split up into six major phases. Each phase has different objectives and peculiarities and consequently must be dealt with in different fashions. 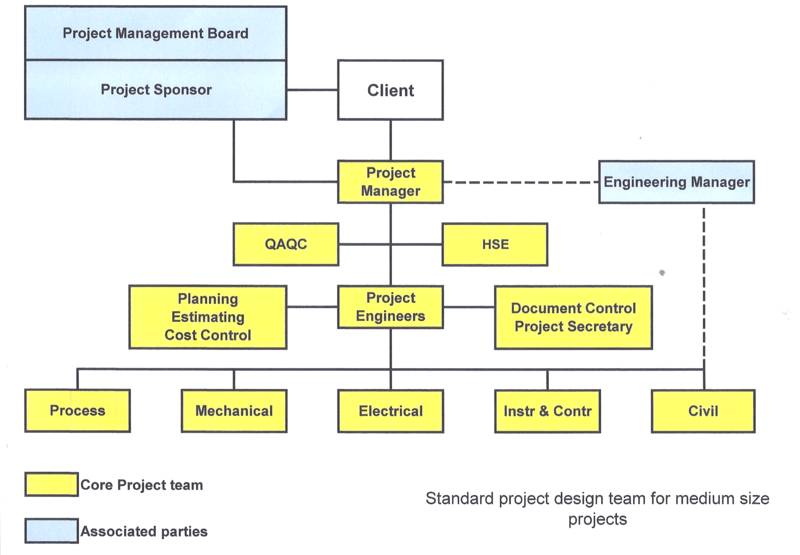 BC can provide project management services for any of the project phases briefly described in this scenario model . This scenario model can be applied to almost any production facility. 1.0 Phase 1 - Conceptual / feasibility studies and front end engineering &design studies. Objective: Identification of the technical and economical feasibility of a facility. Large organizations (end users) sometimes have this study executed by an in-house specialist, but more often the study will be assigned to specialist consultants. ● Response to market demand. ● Preferred locations with regard to infrastructure, employment, and the geographical environment. ● Impact and effect on the environment with regard to waste (gas) emission and potential adverse events. ● Effects on the community and its infrastructure. ● Preliminary cost estimate (± 30% accuracy). ● Economic profile; such as, Capital Expenditure (CAPEX), Operational Expenditure (OPEX), Discounted Cash Flow Rate of Return (DCFROR). ● Establishing a risk profile. When the objectives of the conceptual/feasibility study have been found realistic, and has been approved based on data and information evolved from this study, a FEED study can be developed. In general the level of detail of the FEED study should be such that a construction contractor can prepare a tender to engineer, procure the material, and construct the facility. The FEED is to focus on system design, preparation of specifications, and the preparation of an accurate cost estimate (± 15 % accuracy). Geotechnical and geographical surveys as well as detailed environmental impact/effect studies may be part of the scope but also may be included in Phase 2.0 . ● A clear technical scope of work. ● Clear technical objectives of the facility. ● A well-defined scope of services to be rendered. ● A comprehensive budget showing, costs and man hours. ● The resources required, including subcontracted services. ● The execution scenario showing internal and client interactions. ● The project schedule showing the actual progress, the originally planned progress, and the current forecast of work. ● The cost/expenditure schedule showing planned, actual, and forecast expenditure. ● An accurate list of what is to be provided under contract (essential for good planning and progress measuring). ● The cash flow; showing committed, paid, invoiced, received, and outstanding. ● The contractual constraints, such as, payment conditions, advance payments/bank guarantees, liquidated damages, performance bonds. completion certificates. ● The lines of communication - internal and external. ● The progress reporting, format and frequency. On completion of Phase 1, the FEED study documents can be used for tendering for the final design phase, some (large) Engineer Procure and Construct (EPC) contractors often have the resources for combining the last phases of project execution up to and inclusive of the final project close out. However as these phases have their peculiar characteristics they are addressed as separate activities. Preparation of a detail design requires all items as listed under the FEED study of Phase 1, however systems must be further detailed. Material Requisitions (MR) for equipment and long lead items must be prepared and submitted for cost estimates, and when so desired; for purchase. During this phase the facility will be built and constructed and represents the major part of the capital investment. The construction phase can take up to 80 % of the total CAPEX. Hence good cost control and cash flow control as well as planning are essential components for success. Engineering will be limited to support activities, for performing design modifications that become apparent during construction to fit the site conditions. ● Human Resources: Engineers, technicians, skilled and unskilled labor. ● Material procurement of equipment and bulk material. ● Temporary storage and control of material movement. ● Planning and interfacing with the plant operation, and other projects being simultaneously executed. ● Health, Safety and the Environment (HSE). ● Cost and cash flow control and planning. ● Step wise check and energize the supply the control systems and the backup systems. ● Phase wise start up of the support system such as utilities, water cooling system, water supply etc. ● Step wise start up of the production facilities; provide “Permissives”; i.e., temporary shut down bypasses. ● Once a system is running, the shut down bypasses are to be cancelled and the system is to move to the normal mode of operation. ● Once all systems are running, check that all operating conditions are within design parameters. ● Announce an – All is clear advice – the facility is now in operation and on stream. ● Start “Hand Over” operation procedures to end user/owner. After handover, depending on the contractual conditions, the end user or owner may issue the Provisional Completion Certificate taking ownership of the facility. Warranty clauses and performance guarantee conditions will now become effective. After the expiration date of the warranty and the guarantee period, the end user/owner may issue the Final Close out Certificate, taking full ownership of the facility.